Since the invention of the amplifier, tubes have remained the most fascinating component of electronic sound technology. 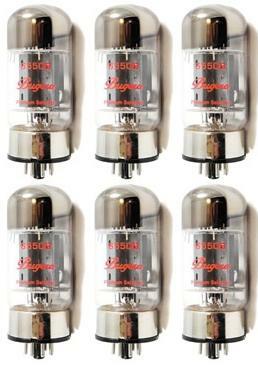 You don�t have to be a tweaked-out tone freak to know that the kind of tube you use in your favorite amp plays an enormous role in shaping the personality of your sound. As certified tone maniacs ourselves, we offer a wide variety of premium hand-selected tubes to meet the tonal tastes of all breeds of musicians. We proudly offer tubes that deliver sun-drenched California cleans, as well as tubes that infuse your sound with an overcast British grind. Our various preamp tubes complement your amps power stage while maintaining incredibly low noise and minimal microphonics.